Handouts or Material Covered: Copy of Pathway Puzzle Problem . 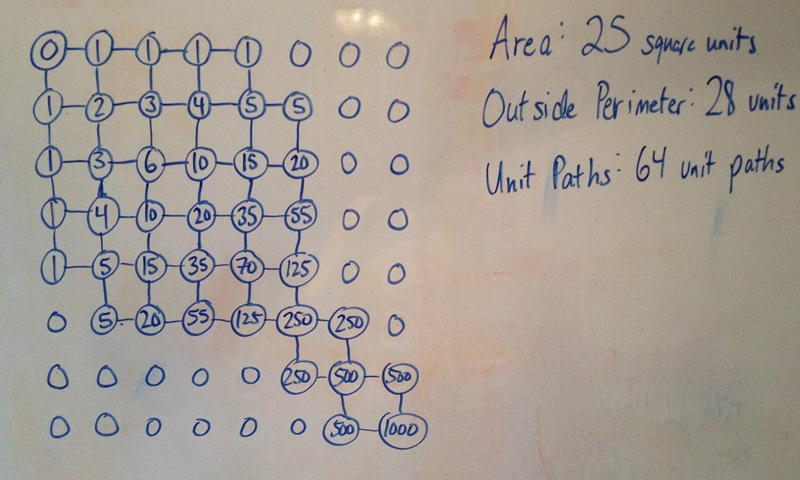 We also used Pascal’s Triangle to help count the number of paths for grids without missing links. This was the Math Circle contest puzzle from AIM. Our circle submitted the most entries and won five AIM mugs. Two members also won individual mugs for their unique entries: Spencer Pearson (link to puzzle) and Marilyn Howard (link to puzzle). Sponsor(s):The University of Tulsa College of Engineering and Natural Sciences and the American Institute of Mathematics, Math for America Seed Grant. Handouts or Material Covered: Copy of PowerPoint Presentation | PDF version . We performed weird multiplication using intersection math, rectangle math, and party math, all of which turned out to be identical! They were all found by the ordinary multiplication of triangle numbers! Sponsor(s): The University of Tulsa College of Engineering and Natural Sciences and the American Institute of Mathematics, Math for America Seed Grant. Number theory is one of the fundamental fields in mathematics. Properties of particular natural numbers and sequences of numbers have attracted the curiosity of mathematicians and the general public. In this session we explored surprising properties of some numbers noting the centennial of the birth of the late Martin Gardner, a Tulsa native, whose Scientific American monthly feature “Mathematical Games” and other writings popularized mathematics for over 50 years. At our November meeting we celebrated the life of Martin Gardner, a native Oklahoman and puzzle master extraordinaire, during the 100th anniversary of the year of his birth. Gardner was featured monthly in the Mathematical Games column of Scientific American. We found out that Martin Gardner lived at 2187 S. Owasso Ave, Tulsa, OK and that 2187 turns out to be 37, a lucky number, a Friedman number, and 10000000 in base 3. How cool is that? Session Title:"A Potpourri of Logic Problems"
Matrix puzzles in which one must describe entities by selecting items from various categories. A resource for these puzzles is www.Printable-Puzzles.com. A puzzle from Games World of Puzzles magazine which resembled a matrix puzzle but used a tree diagram showing relations to solve easily. The “Zebra Puzzle”, a well-known logic puzzle originally published in Life International magazine in 1962. (https://www.cs.duke.edu/courses/spring06/cps102/notes/zebra.pdf) Here we changed tactics and used a process of elimination method to solve the puzzle. A sampling of exercises from What is the Name of this Book? by Raymond Smullyan including problems with Knights, Liars, and the Island of the Zombies. Circle members were referred to “The Hardest Logic Puzzle Ever” so named by philosopher George Boolos (http://www.thebigquestions.com/boolos.pdf) . Members were encouraged to try their hand at this puzzle given the experience they now had with logic puzzles. Description: We learned how to do several dazzling magic tricks that required NO skill. These tricks with cards all used very simple mathematical principles, applied cleverly.